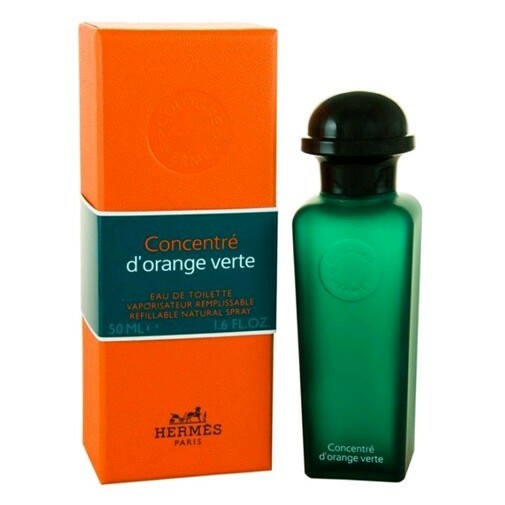 There are 73 reviews of Concentré D'Orange Verte. Very interesting hyper-bitter basil and greenery scent with a hint of bitter orange. Has a very cool minty quality to itas well. Would be great for summers. It smells very similar to Proraso Azur Lime cologne which is a cheaper alternative to this with lime instead of orange. Sillage is moderate while longevity is pretty good for a fresh fragrance. However it is a bit too bitter for my liking. It's hard to do citrus better than Hermes, and JCE. Concentre takes all the pizzazz of the original Orange Vert, and adds the desired longevity, without mangling the notes. There are some off looking notes in the breakdown, but trust me, this is just a longer lasting version of the original. A nice citrus/orange opening. The transition to the "vert" portion begins within the first 30 to 45 minutes, with the vestiges of the citrus still remaining. I pick up a "corn chip" vibe from Concentre D' Orange Vert like I did from Dior's Granville. It's not as pronounced as it was in Granville, but I do smell it. 6 hours in now, and I still smell this fragrance, but it's gone from something refreshing to a deodorant spray. It smells like someone has put deodorant over body odor. When I got home from work, I asked my wife what this smelled like. Her exact words with no mention from me of my impression were, "It smells like someone's sprayed deodorant on to try and cover body odor". And, just to clarify, I sprayed CDOV on my neck and face, not my arm pits. So, there's no reason it should smell like B.O. I'll try it again soon and see if I get the same results. The opening is good, but the dry down was not good, so a neutral for now from me. A special scent indeed, this one has remained one of my favorites if not for its strength and uniqueness. I stumble upon the original "non-concentrated" Orange Verte fragrance from Hermes, which is nice but I'd always wanted to last longer and stronger. Voila, then I found the Concentré version! The heavy citrus vibe won't be everyone's favorite; for me, it has an aromatherapeutic quality that just makes me feel good. There are no member images of Concentré D'Orange Verte yet. Why not be the first?